The Bureau of Mines conducted drilling studies in the Pocahontas No. 3, the Pittsburgh, and a western coalbed to establish the gas migration characteristics for each. Gas pressures in the Pittsburgh coalbed were about 260 lb/in2 and in excess of 550 lb/in2 in the Pocahontas No. 3. Caving in drill holes prevented pressure measurements in the western coalbed. The Pittsburgh coalbed contained intersecting clay veins which formed gas pressure cells. Although these geological features hamper mining, they can be used to control the flow of methane into a mine working. 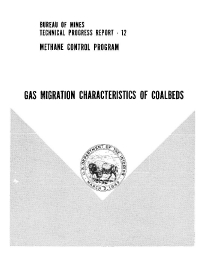 Methane control techniques are proposed for the Pittsburgh and Pocahontas No. 3 coalbeds.